ProSmiles offer our patients in Melbourne affordable dental implants that are a permanent solution to replace your missing teeth. They provide a natural look, improved speaking and chewing, aesthetics and confidence. Contact our clinic today for a no-obligation consultation. If you have any questions, please fill in the form and one of our friendly staff members will get back to you. Your privacy is important to us. We’ll never share your information with anyone. Are you looking to beautify your smile, regain confidence and esteem? 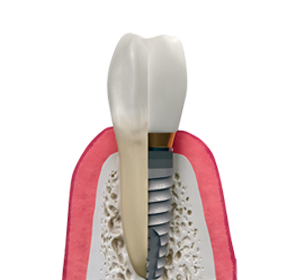 If you have lost one tooth or multiple teeth, we at ProSmiles we offer a selection of dental implant treatment options. Reduce bone loss and talk with us today for a natural looking smile. The service at Prosmiles Collingwood is fantastic. I had two wisdom teeth out and I was back at work in less than 24hrs. Everyone in the team really know how to make you feel welcome, safe and valued. Thanks guys, 11 out of 10!! Fantastic Dentist!! The staff are very friendly and welcoming. Madhur is a very good dentist. He makes you feel safe and makes the experience enjoyable. He talks you through all procedures he does, and discusses in detail any decisions he thinks needs to be made. I would highly recommend. One of the friendliest dentists I have ever been to. All the staff very welcoming and assuring. Highly recommend this place. The team at Prosmiles is very friendly and genuinely caring. Madhur was very thorough & explained everything to me. I would highly recommend this place and will definitely be going back. Keep up the fantastic work! Madhur is a very passionate dentist and most importantly a very approachable, honest down to earth person.This was my most pleasant dental experience. The staff is also very friendly and caring. I would highly recommend the clinic. Went in Today, The staff are exceptional and really down to earth. The service is amazing and the prices are affordable. They explain in detail and educate you about your teeth. 5 stars all the way. Madur the Dentist was phenomenal! Definitely will be back. Since they are attached directly to the jawbone, they can last a lifetime. They don't only function exactly as your natural teeth would but also look and feel just like a real set of teeth. Even if you lose a tooth in the back of your mouth, it is important to get it replaced. If you have missing teeth or want to get rid of your dentures permanently and replace them with dental implants, then contact us today and set up an appointment to learn more about our affordable dental implants and see if you are a valid candidate for it.